The event will be hosted by Dimitris Melas, MSCI Executive Director and Global Head of New Product Research, and Roger Urwin, Special Adviser to MSCI and Global Head of Investment Content at Towers Watson. 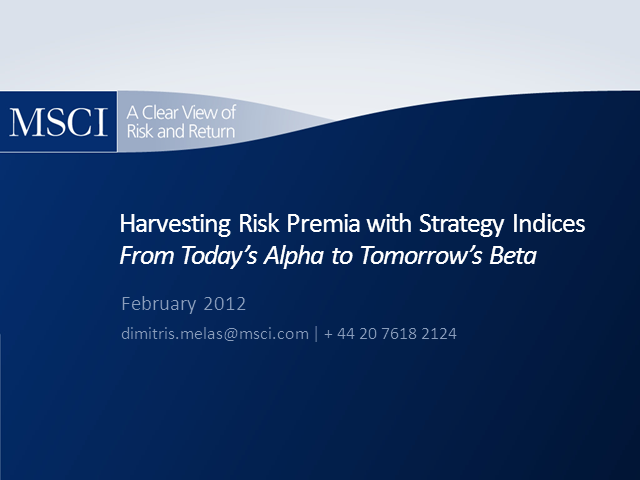 * Definitions of alpha are evolving as investors recognise that strategy indices can capture various systematic risk premia (alternative beta) such as value, size, low volatility or momentum. Systematic factors are increasingly considered key drivers of long-term performance. * Institutional asset allocation may be on the verge of a shift from diversification across active managers in multiple alpha mandates towards diversification across strategy betas in multiple index mandates. * We present a risk budgeting framework for integrating strategy indices into institutional portfolios where allocations to risk premia strategies are based on their expected risk and performance characteristics. * Increasing adoption of risk-based asset allocation, growing acceptance of the potential impact of systematic risk factors on long-term portfolio performance and the need to capture these factors through transparent and cost effective vehicles may drive further innovation and new product development in the indexing arena.